Institute for Democracy and Mediation (IDM) presented on July 14th 2016 in the premises of Rogner Hotel the findings of the 2015 Civil Society Organization Sustainability Index for Albania. The Civil Society Organization Sustainability Index (CSOSI) for Central and Eastern Europe and Euroasia has been used since 1997 to assess the sustainability of the CSO sector. The Index measures the sustainability of each country’s CSO sector based on the CSOSI’s seven dimensions: legal environment, organizational capacity, financial viability, advocacy, service provision, infrastructure, and public image. IDM has been entrusted the task to prepare the report since 2010. 2015 was a turbulent year throughout Central and Eastern Europe and Eurasia, both politically and economically. Political instability was particularly prevalent throughout Southeastern Europe. However, while civil society in a number of countries is confronting democratic backsliding, CSOs are also increasingly responding to regional challenges – such as the refugee crisis and promoting EU-related reforms. 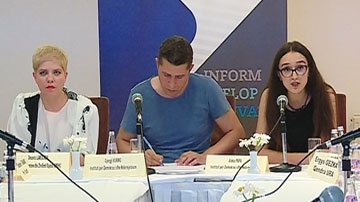 The Report’s findings for Albania were presented by Ms. Aleka Papa, who underlined the slight “improvements” in relation to the dimensions of legal environment and financial viability, while indicating the “stagnation” in all other dimensions—and overall CSO sustainability. Commenting the findings of the report, Mr. Vladimir Thano (Pro Youth/Member of NCCS), Mr. Ergys Gezka (Qendra Ura/Member of NCCS) and Mr. Juljan Papaproko (World Vision Albania) offered their perspective on the general concerns and challenges for the civic sector as regards the legal environment, financial viability and service delivery, respectively. Ms. Desareta Lameborshi (Grants Administration and Regional Development, ASCS) discussed about the role and challenges of ASCS as the only source of public financing for the sector. The panel debate was attended by various representatives of civil society, state institutions and ASCS. The Index is developed by the US Agency for International Development in partnership with the local organizations of the countries included in the Index. For the 2015 Country Report for Albania in the Albanian language click here!